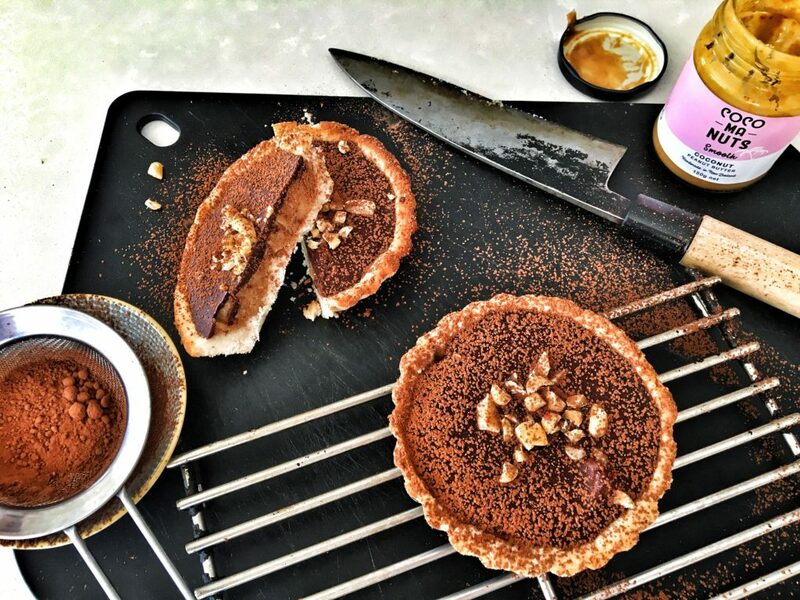 ﻿ Salted Caramel Peanut Tart - I AM Co. Completely vegan friendly this is definitely what we consider an ‘occasional’ treat but so more-ish you’d be forgiven for wanting it a bit more often than what we’d recommend. We wanted to utilise this wee pot of gold from Cocomanuts into the recipe but you can easily substitute this out for another brand of nut butter. Preheat the oven to 180 deg Celsius Bake. Grease 4 x loose bottom tart tins with a little of coconut oil then set aside. To make the shortbread crust, combine the coconut oil & maple syrup in a bowl and mix well to ensure there are no lumps. Once combined, add the coconut flour and salt and mix until a dough forms. Press the dough into the prepared tart tins and bake for 10min or until golden. While the tart cases cool make the caramel filling. Using a high powered blender add all the ingredients together and combine until a smooth consistency is reached. Just make sure the dates are pitted! If it’s too thick just loosen with more hot water a teaspoon at a time. Spread the caramel mix over the base of each tart tin and chill in the fridge while you prepare the chocolate topping. For the chocolate, whisk all the ingredients together until super smooth and pour over the caramel filling on each tart. Garnish with chopped nuts and extra flaky salt.